-t-shirt & budo pants + shinai, weaponbag, oil, maintainance equipments. During the basic course you will learn how to use bamboo sword (shinai) and basic movements.We recomend to use #100021 Ikken during the basic course . Many advanced players use Ikken for basic training. For adults(18+) 39'' shinai is maximum lenght. The minimum weight for men's shinai is 510g for competitions and for women 480g is minimum.Women often use 38'' length shinai.We recomend to ask shinai size for junior from our clerk, your trainer or you can check your local association regulations.You can ask help from our clerk and we will propose best posibilities for you (e.g. big grip, light weight, for women, etc.). You have the make a maintainance for the shinai so you need shinai oil and tools.Usually you can use regular home tools, but there are easy to use special tools for this purpose like scraper and knife. These tools have special shapes and edges for shinai. You are not allows to carry shinai on street without cover so you need a weaponbag. Weapon bag will also cover your shinai from dirt and hits. We recomend to use t-shirt and pants for start. Pants should not to be too long and not to go under your foot so you wont slip during the practise.You can use black budo pants which you can continue to use in iaido or just as a home wear after the course. The basic course will end to a exam of 6th kyu and you will proceed to next practise course where you can use kendo gi (jacket) and hakama (skirt style broad pants).Usually you use blue uniform in kendo - older men, all women and children can you white uniform.Tradional is indigo blue, but there are chemical colors now too.Color fill fade out during use and washing.There are uniforms for hot seasons too.We recomend blue jacket #32001 and hakama #31001 to start. Ofcourse you can get indigo uniform (gi #32100/#320015 and hakama #31100), if you think you can manage with it - we recomend hand wash and careful folding after each use. One shinai wont last for so long so we recomend to get second shinai just in case or search for your style shinai (oval handle, big handle, etc. ).You will also start practising kata (formal practise) where you use wooden sword - bokken or bokuto. 102cm for adults and 90cm for children according to height and muscles.High quality bokken willl last years in use. Bogu (armor) you need after second course. Bogu will make possible to practise competition and proper style with hits.First is better to get economical bogu and get to know your style. When you advance you can search your style bogu.Bogu will last for years in use so all the most economical (6mm) models are for juniors with growth to see.There are some special shinais which are better for different styles and size and you will learn which style is best for you.There are some shinai for learning the proper swing or build muscles - suburi shinai. New uniform will give you confidence and better image for camps, shows and high grade exams. You should use name tag (zekken or nafuda) where is your city and/or team name or label and your name (usually first character of first name - dot - and last name. This will help teachers to identify you and give personal feed back. Kendo kata can be made also with metal swords which are specially made for this use. 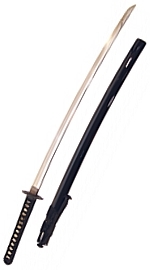 Recolar iaido sword does not work for this spo the blade must be specially forged. We recomend long sword #60020 and short sowrd #60021.